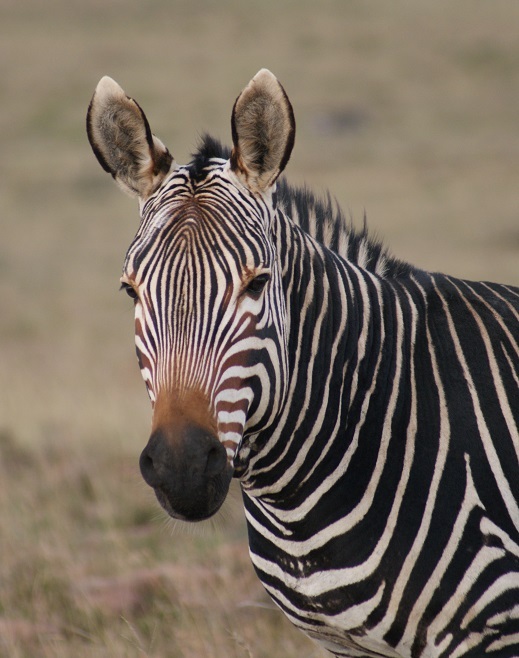 Naturally enough, we expect to see Cape Mountain Zebra (Equus zebra zebra) in the Mountain Zebra National Park situated on the northern slopes of the Bankberg near Cradock. 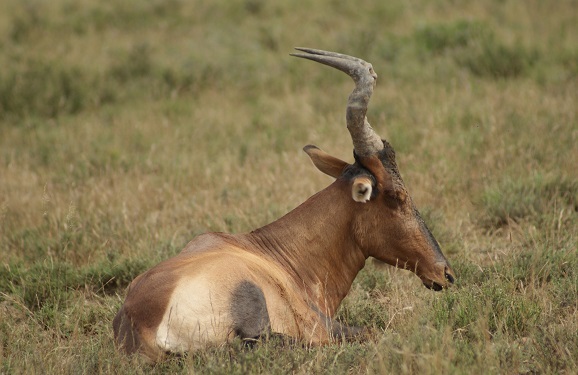 This is a predominantly grazing species that prefers medium-height grass and so are plentiful in the plateau area of Rooiplaat and Juriesdam. 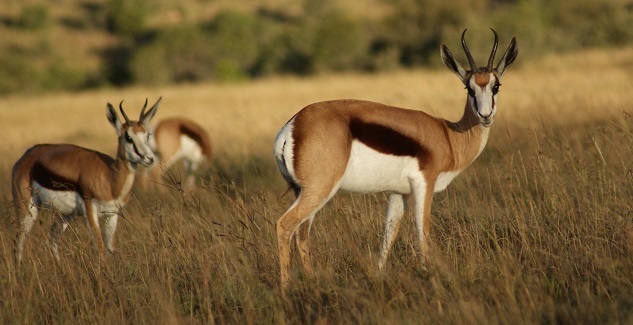 It is wonderful to see large herds of South Africa’s national animal, the Springbuck (Antidorcas marsupialis), grazing in the veld all over the Park. 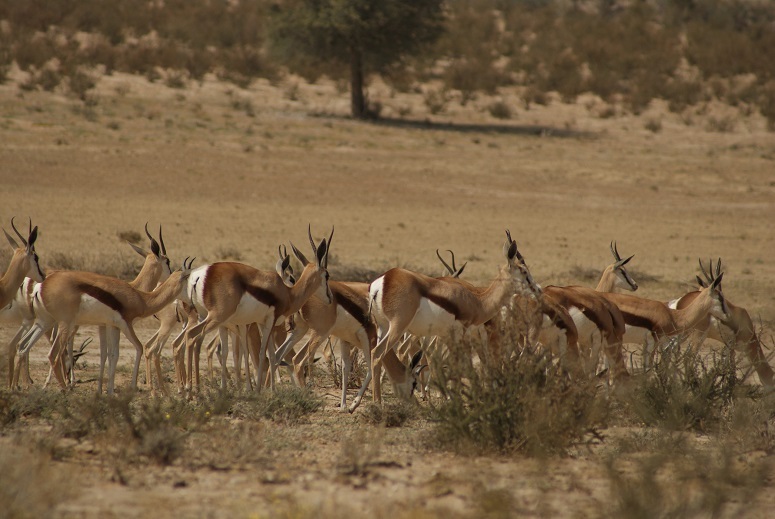 We did not see as many Gemsbok (Oryx gazelle) as we have on previous visits. This one was bounding across the grassland with considerable haste. 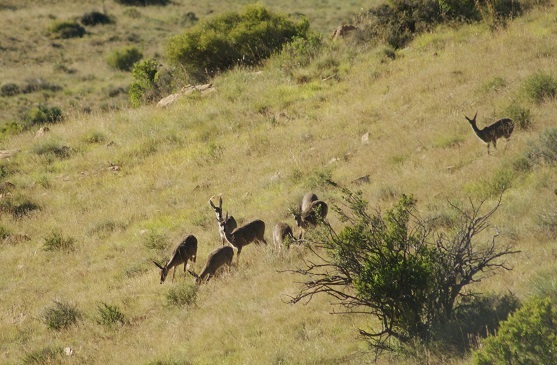 It was very interesting to happen upon a small herd of Mountain Reedbuck (Redunca fulvorufula) and to watch how quickly and nimbly they could run up the steep, rocky, mountain slope! 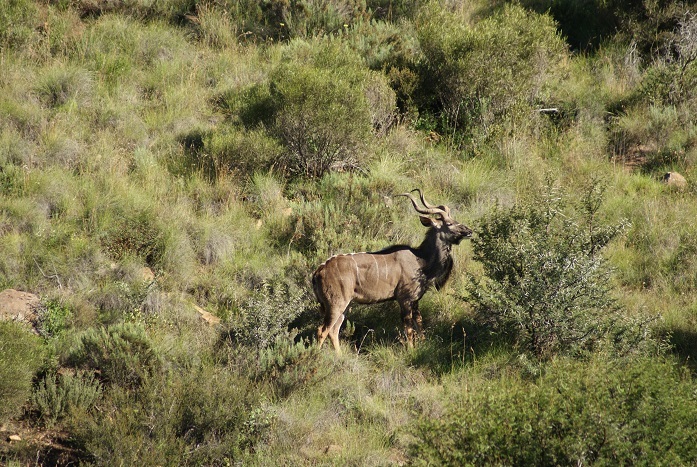 The Kudu (Tragelaphus strepsiceros) were scattered here and there. They are mainly browsers rather than grazers. 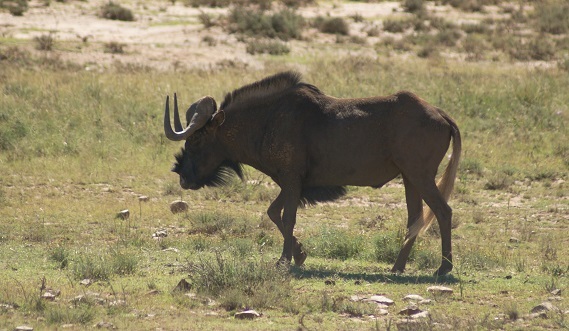 Sizeable herds of Black Wildebeest (Connochaetes gnou) as well as individuals abound in the Park. The yearning is swelling within to make another long trek to the Kgalagadi Transfrontier Park: to experience the space, the silence, the starlit skies you can almost touch, and the complete lack of connectivity with cell phones and the internet. 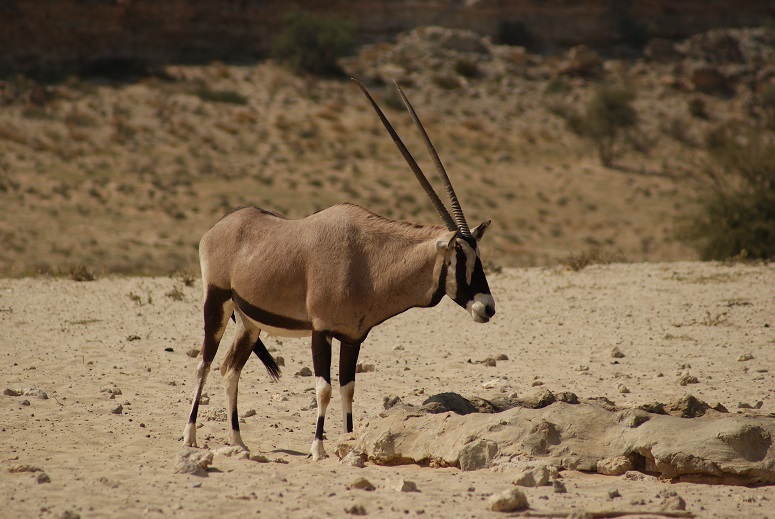 Gemsbok are endemic to this arid region – they are such regal animals. Springbuck appear in large herds, reminiscent of what it must have been like before senseless European hunters bagged as many as they could in the name of fun. 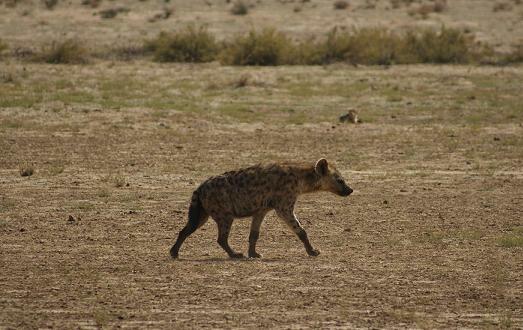 Spotted hyenas help clean the veld of bones and so help prevent the spread of diseases. 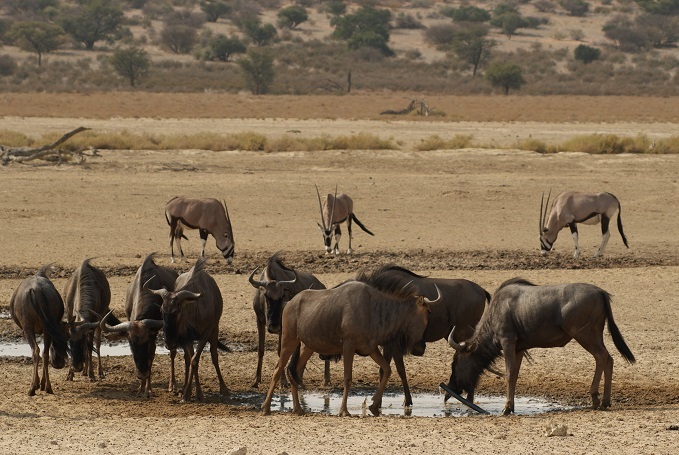 Blue wildebeest gather around the small, concrete-lined waterholes and seek the shade of scrawny trees during the hottest part of the day. 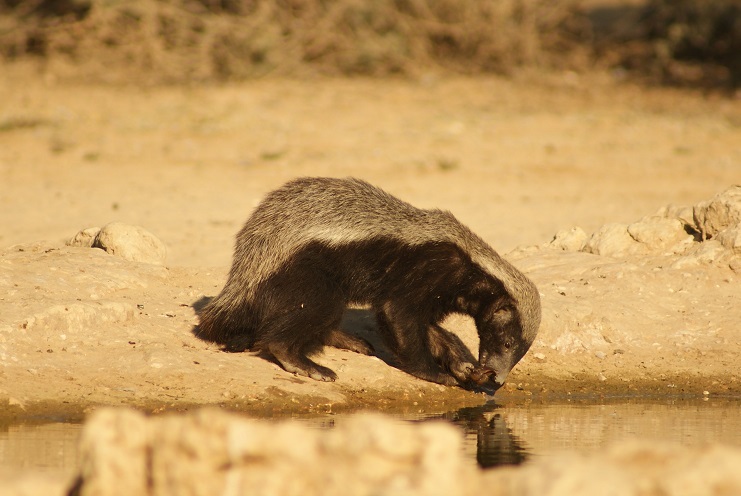 What a privilege it is to see a ratel / honey badger out in the open like this. Then, of course, everyone keeps a sharp eye out for lions! 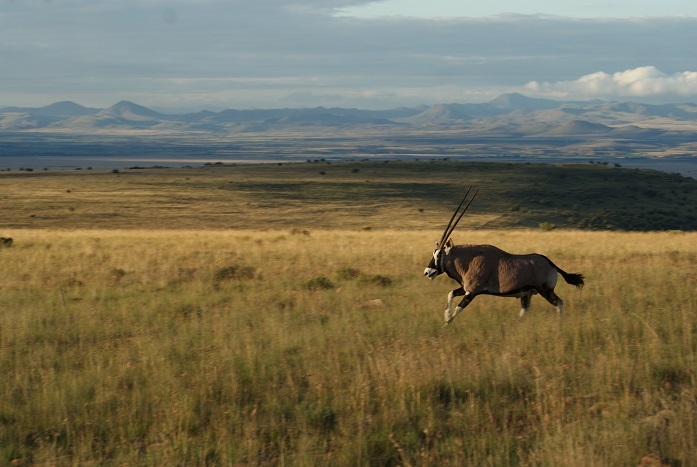 Visit the Mountain Zebra National Park if you want peace, spectacular view and wide open spaces. Granted there is the attraction of cheetah, lions and perhaps seeing a black rhinoceros, but you will not find wild animals around every corner. When you do come across them though, you are bound to marvel at their ability to survive in this arid environment. It was heavenly waking up there to the beautiful calls of the fiery-necked nightjars before dawn, the cheerful chirping of the white browed sparrow weavers and the reassuring cooing of Cape turtle doves. 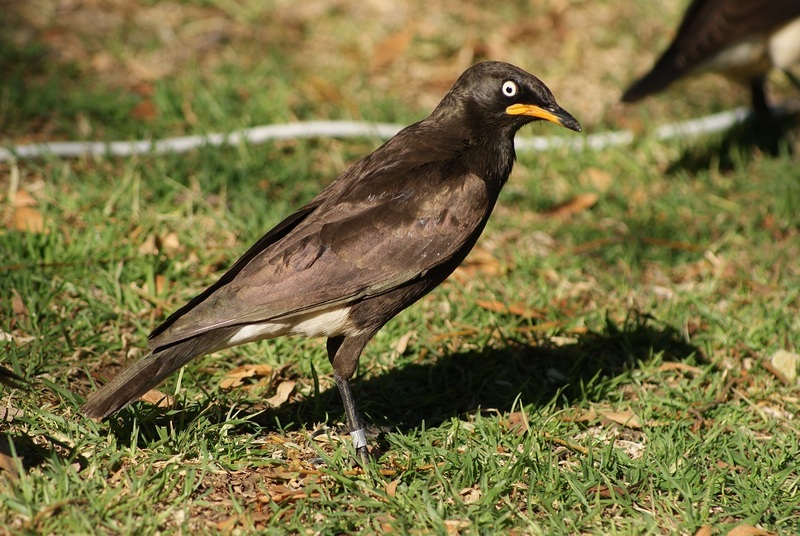 The flocks of pied starlings also make their presence known from early in the morning. 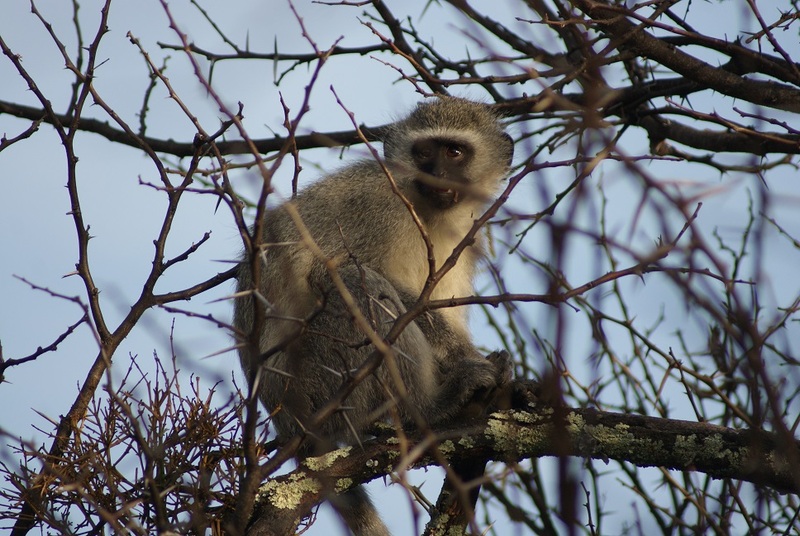 Vervet monkeys made their appearance in the camping area as soon as it was light, moving effortlessly through the tangle of long-thorned acacias. They clambered over the caravan parked next to this thicket, inspected it from every angle and made off with whatever they could find before the inhabitants had even woken up! Nothing can be left out unattended – this is a situation one simply has to accept when camping here. It also explains the heavy wooden doors to the kitchen, laundry and ablution block as well as the lids to the rubbish bins provided. At least one monkey slipped into our closed tent while we were on a game drive in the afternoon and ate bits of the avocado pear I had been looking forward to consuming for supper. Ground squirrels did the same to me in the Kgalagadi Transfrontier Park! While on the subject of gnawing, I noticed that several trees in the camping area are surrounded by low fences. 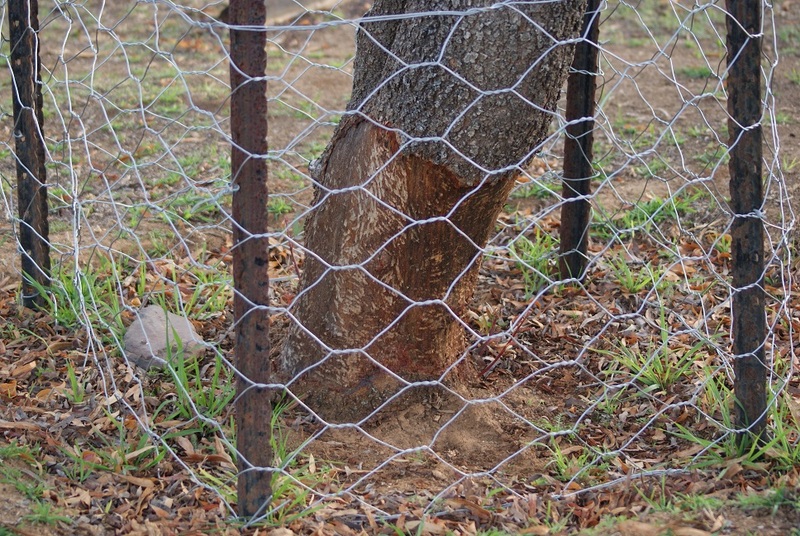 These are clearly to protect the trunks from being ring-barked by porcupines. Our game drives were punctuated by stops at various viewpoints to stretch our legs, appreciate the panoramic views, and identify animal droppings. At one place we poured over illustrations in our bird books to identify a raptor perched on the top of a bush on a low hill above us. It turned out to be a black harrier – an identification finally confirmed when it flew off to reveal its distinctive wing and tail patterns. Although the weather was too cold to swim at this time of the year, the rock pool fed by a mountain stream in the picnic area was a relaxing place for a light snack and to feel the warmth emanating from the large, smooth outcrop of granite. I walked around the perimeter of the area, looking out for birds, smelling the different vegetation, and enjoying the gentle roar of the strong breeze soughing through the valley. The clucking of a large flock of helmeted guineafowl added to the languid atmosphere: if our stay in the Park had been longer, I might have been tempted to spend the rest of the day there. 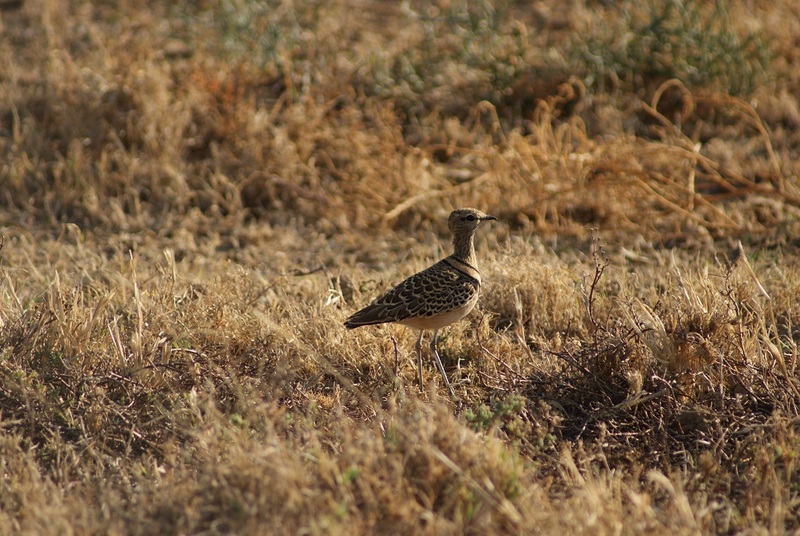 It was while we were watching a mixed herd of Gemsbuck and red hartebeest on the Ubejane Loop later that I spotted the handsome looking double-banded courser, well camouflaged in the tussocks of grass – proof that it is worth scanning the veld all around regardless of what might have captured one’s attention at first. At a micro level, back at the camp, it was fascinating to watch teeming harvester ants hard at work on the patch of lawn near our tent. They worked tirelessly, carrying tiny sticks and blades of grass to the entrance of their nest. This reminded me of when we first moved to Mmabatho and tried to encourage a patch of grass to grow into a lawn. 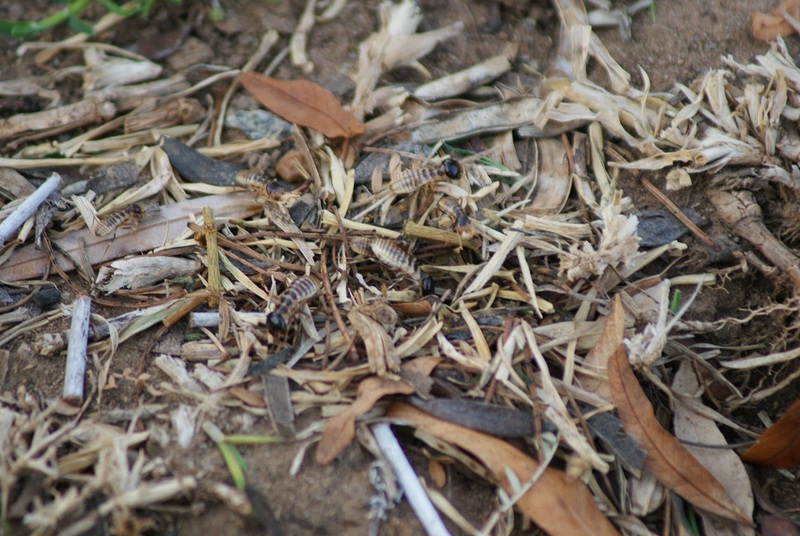 We saw these busy ants at work late one afternoon and thought nothing of their antics. By the following morning our carefully nurtured ‘lawn’ had disappeared! According to Brewer’s Dictionary of Phrase and Fable a ‘dog in a manger’ refers to a mean-spirited person who refuses to let others use what is wanted by them, yet does not use it himself/herself. This in turn alludes to the fable of a dog sitting in a manger and not letting the ox eat the hay in it even though the dog would not eat it either! 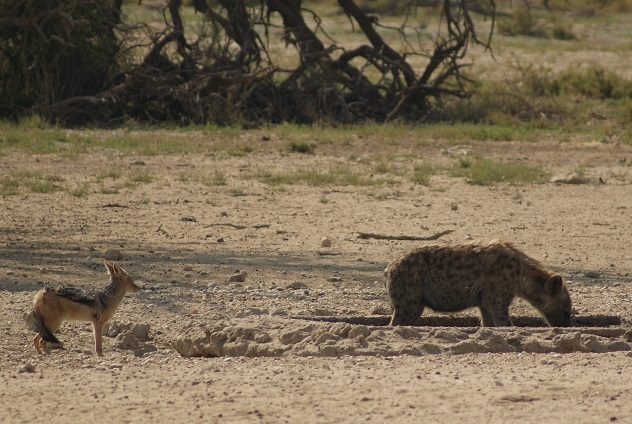 It was at the Kameelsleep waterhole (71 Km from Nossob) in the Kgalagadi Transfrontier National Park that we saw a Spotted Hyena (Crocuta crocuta) exhibiting similar behaviour. 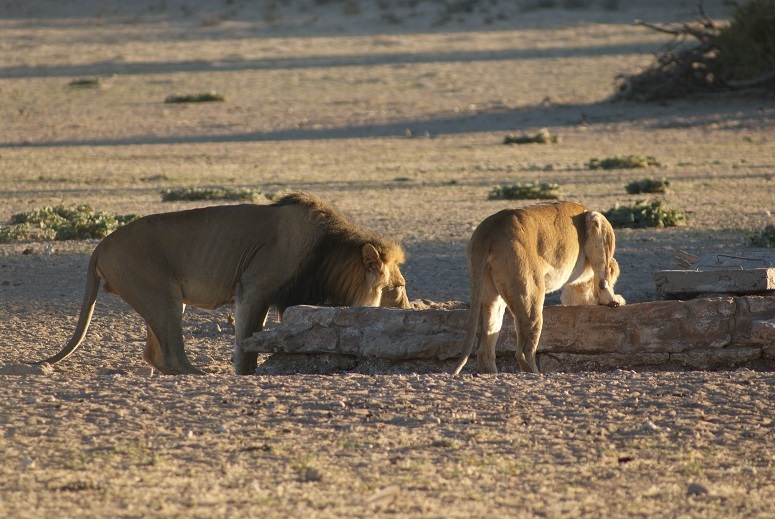 This particular waterhole is in the form of a water trough, rather than a pool or dam, surrounded by the pale Kalahari sand. 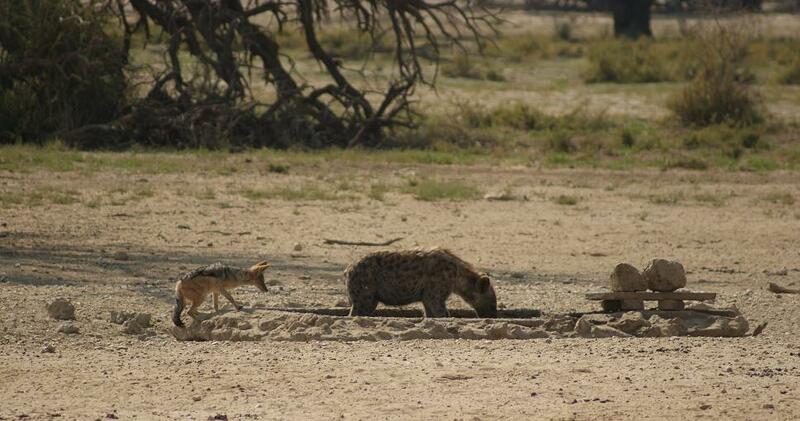 The hyena was already standing in the trough and drinking when we arrived. The apparently tranquil scene included a small herd of Gemsbuck (Oryx gazelle) gathered near the trees and a single Black-backed Jackal (Canis mesomelas) positioned close to the water trough. Every now and then this opportunistic creature would creep ever closer and even mount the edge of the trough to try and get to the water. Each time it would be rebuffed by the hyena and retreat with a submissive stance to either curl up on the ground for a while or remain standing a short distance away. The jackal kept a sharp focus on every move of the hyena. 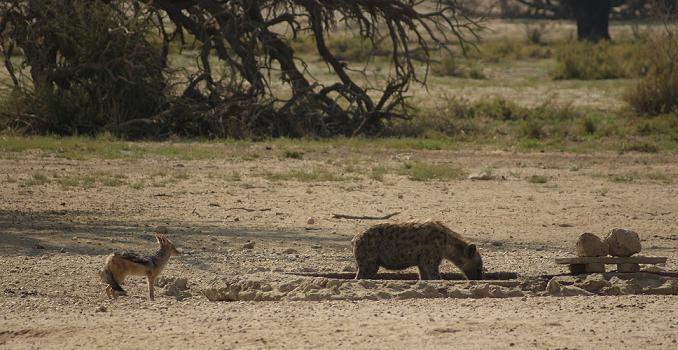 The hyena meanwhile had clearly had its fill of water and simply remained standing in the trough. Once it got out, but as soon as the jackal darted closer it stepped right back into the water! This impasse continued for some time. Once the hyena finally decided to leave, it was fascinating to observe the behaviour of the other animals. The jackal, of course, wasted no time to take its turn to lap at the water. A small group of gemsbuck, however, detached themselves from the herd and gave the impression of ganging up against the hyena and marching it off their territory! They did this by grouping closely together with their heads lowered. It was in this fashion that they walked steadfastly behind the hyena for some distance before returning to the waterhole to join the others in the dappled shade. In the absence of a suitable guide book in the shops within the Park, we were pleased to have brought the 2013 edition of Go! Kgalagadi with us. It was from this publication that we learned that the name Kameelsleep comes from it having been the place where the last giraffe (kameelperd) was shot and dragged off. Happily, these graceful animals have since been re-introduced and we were able to enjoy some magnificent views of them browsing amongst the trees in the area of Mata-Mata.